On March 11, 2014, the Miami HEAT unveiled its 13th Miami HEAT Learn & Play Center at Branches Lakeview. HEAT players Michael Beasley and Greg Oden led a host of dignitaries alongside presenting sponsor and longtime HEAT community partner Florida Blue to unveil the newly renovated reading room and computer lab. The space was transformed and outfitted with new paint, wall graphics, Samsung Galaxy tablets, and furniture and is now simply amazing! The press conference kicked off the event followed by a ribbon-cutting ceremony. At the press conference, the name of the Branches site in North Miami was unveiled as the Trish and Dan Bell Family Branches Center – Lakeview Campus. Just a month before, Branches also unveiled the Trish and Dan Bell Family Branches Center – Florida City Campus at its Groundbreaking Ceremony. After the press conference, HEAT players, Branches Board Members and sponsors interacted with the Branches students in the new HEAT Learn & Play Center. Trish and Dan Bell have been anonymously supporting Branches since 2005 through generous matching grants and an endowment for summer camp scholarships provided to children. Combined, they have contributed or pledged nearly $7,000,000 to the organization to date. During this timeframe, Branches has scaled operations from one site and less than 1,000 served to four sites throughout Miami-Dade County serving over 11,000 children, youth and adults each year. The organization has grown to 60 employees and is supported by over 150 active volunteers. Branches has a 100% high school graduation rate among its students who have stayed in the Branches program through high school, and it currently has 19 of its students in college, many of whom are the first in their families to attend college. Branches is grateful for the generous support that Trish and Dan Bell have provided over the last many years, which currently includes two new matching grants of up to $530,000 to complete the Branches Capital Campaign, and up to $900,000 for the annual operational campaign. Watch the video to see all the fun! Please click here. 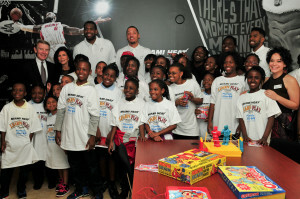 To view all Miami HEAT Learn & Play Center photos, please click here. GO HEAT!